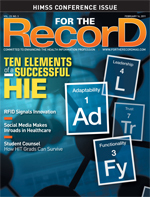 A health system has incorporated the technology into its mobile EHR platform, while forward-thinking developers use RFID to help improve diabetes management. Radio-frequency identification (RFID) technology has been around for decades but has not been widely utilized in healthcare. Concerns over cost and return on investment have led organizations to choose less expensive, albeit less versatile, bar-coding solutions. However, in recent years, consumer electronics companies have continued to lower prices for wireless devices and components, and both healthcare providers and medical device manufacturers are taking advantage of that cost curve to implement RFID technologies. Applications range from patient ID and chronic disease diagnosis and management to medication administration, medical records tracking, and EHR access. Heritage Valley Health System, which provides comprehensive healthcare in Pennsylvania, eastern Ohio, and the West Virginia panhandle, has developed a mobile clinical access portal (MCAP) and device application collaboration solution (DACS). MCAP is a handheld EHR device that allows physicians and clinicians to view patient records anywhere there is a Wi-Fi or broadband connection. In addition, these mobile devices are equipped with an RFID tag that gives users the ability to move seamlessly from the handheld EHR to any desktop or laptop computer equipped with an RFID reader. The technology has been successfully deployed for three years. Since the real estate on a handheld device is limited, physicians often want to view EHR information on a larger screen or collaborate with colleagues. This is where RFID comes in to establish a connection to a fixed device. Each handheld unit has a flat RFID tag attached on the back that identifies the device and the doctor who owns it. The physician simply walks up to one of the computers or other fixed devices provided on all floors and in every room that have mouse-sized flat readers for the RFID tag. The physician “tags” the reader (ie, moves the tag into close proximity to the reader), at which time the reader recognizes the tag number and logs the physician in to the fixed device, where information is shown on a larger screen. For instance, if the device the doctor tags is located in a patient room, the system knows which room it is and that the doctor will therefore want to access records on one or both patients in the room. The software instantly offers a choice between the two patients, and when the doctor makes a choice, it brings up the patient’s vital signs, progress notes, labs, radiology, and other relevant information. Physicians can also request specific defaults to collaborate with colleagues. By knowing a physician’s identity, the software can automatically log him or her in to the appropriate desktop without requiring an ID or a password. Physicians can also launch various vendors’ EMRs, but autonavigation is not available in that case. Physicians who don’t have their handheld device with them can log in to the EHR from anywhere using the RFID tag attached to their name badge. The only difference is the absence of MCAP’s intelligence to automatically take the doctor to a specific patient depending on the location. The system will default to the physician’s EHR standard first page or census page. Similarly, nurses can log in to nursing documentation screens using the RFID tags on their name badges; they do not carry handheld devices. In 2009, Heritage Valley won the prestigious Microsoft Health Users Group annual MS-HUG Healthcare Innovation Award for Clinical Records – Inpatient for developing the MCAP and DACS. The awards showcase how organizations use technology to enhance and transform the quality of patient care, reduce costs, streamline clinical and business processes, drive interoperability, improve productivity and workflow, and enable informed decisions. In 2010, Heritage Valley was honored with the Hospital & Healthsystem Association of Pennsylvania achievement award for its work with MCAP. Concurrently, the company has developed a prototype of a diabetes management device to facilitate the monitoring of blood glucose levels. Called iglucose, the device automatically and wirelessly transmits within seconds the glucose numbers for a person with diabetes from a data-capable glucometer to the iglucose database. In addition, iglucose automatically communicates blood glucose readings to healthcare providers and the patient’s loved ones. The patient connects a glucometer to iglucose, which powers up the glucometer, pulls down the most recent data, and sends that data to the online database via a wireless network. “That information can be accessed, for example, by a parent who is monitoring the readings of a child drawing blood at school or by the caregiver of an elderly parent to ensure compliance,” says Tomek. iglucose technology may eventually be combined with the company’s GlucoChip and Wireless Body to create a seamless way to obtain continuous blood glucose readings from inside the body and transmit them for monitoring and management. In the meantime, the GlucoChip is under development; no prototype has been created, and it has not been tested with patients. The sensor is being tested in the laboratory in blood and interstitial fluid. The company is also initiating a study with the Diabetes Research Institute at the University of Miami and Jackson Memorial Hospital to test diffusion and biocompatibility of the membrane to be used in the device’s sensor. The next step will be to incorporate the sensor with the electronic components of the microchip. Then the device will be tested in animals and humans. Beyond diabetes management, the Wireless Body platform may be further developed for other vital sign-sensing applications and the identification of implanted medical devices such as vascular ports. “Our ultimate goal is to give patients freedom from the burdens of disease management, increase their compliance through painless applications, and therefore improve their health outcomes, decrease costs, and decrease the burdens on the healthcare system,” says Tomek.